The recent break up of the deal of Bharti might have created some pressure on the stock prices but in the long run the stock remains highly attractive due to its strong expansion desires and financial stability which adds a strong competitiveness in the company. This articles is for those investors who wants to reap the creams of doing investment in the long run. We will discuss the core financial strengths as well as the desires of expansion along with the threats the company have in the near term. Bharti Airtel's bold expansion plans are unlikely to be dimmed by the second breakdown over a $24 billion deal with South Africa's MTN but the Indian firm have to shifted its focus to smaller targets.They are planning further for expansion plans in Kuwait's Zain, Sweden's Millicom and Egypt's Orascom. Kuwait's Zain deal might be cracked by Bharti airtel as the former puts 46% stake in the Arab world's third-largest telecom up for sale. One other possibility could be Millicom, which has operations in 16 countries in Asia, Latin America and Africa. It may even make a bid for Luxembourg-based Millicom International Cellular (MICC).Putting a global foot mark of Bharti is now a part of the companies only expansion path as the domestic market gets saturated. The company can only grow in two places primarily through overseas acquisition and early bidding of 3G. The company now keenly focuses on 3G auction. Indian cellular operators are keen to obtain 3G bandwidth as it will allow them to offer high-speed services that can be used by mobile subscribers ready to pay extra for multimedia services such as email and video on their phones. The Indian government has announced it will auction four India-wide 3G slots of radio bandwidth in December and has imposed a floor price of 35 billion rupees (716 million dollars). Looking at the financial position of the company, the company has enough cash flow to go for bidding of 3G auction. A look at the Financial. In balance sheet we find that company have a strong reserves of Rs25,627.38 (March 2009), Rs18,283.82, Rs 9,515.21 for the past 3 financial years. For the 30th June 2009 we find other income quarterly growth by 824% as compared to 31st March 2009.This reveals that if the company goes for any acquisition or 3G auction the company can derive the advantage backed by its strong internal accruals. Secured loans have got reduced and unsecured loans are having consistency with the previous financial years. The companies fixed deposits took a jump of 594% ending on March 2009, compared to last financial year. The contingent liabilities part got reduced by 42.5% for the year ending March 2009.Its expenses are under consistency tab giving less space of inefficient use of resources and assets of the company. Many of the readers might ask the question why yearly financials are discussed. Its for this reason that investors should look for long term appreciation of their investments. Short term outlooks are often filled up with sentimental and speculators play. 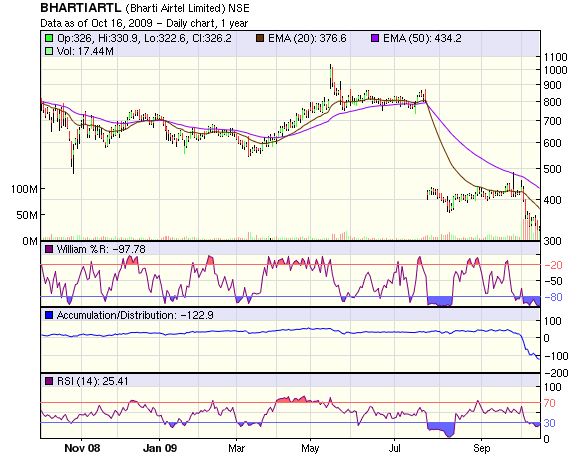 According to William% R Bharti is trading at below oversold level. RSI indicates that Bharti is also near to oversold level but if the sensex goes down by 500 point+ we might get Bharti around Rs 330-Rs320.The stock at present is under distribution phase and will enter into accumulation phase depending upon the 2nd quarter results. The 2nd quarter results will be keenly watched to decide the future movement of price. The chart below shows the details of the Technical analysis. The resistance and support levels of Bharti are as follows. The company like others in the industry faces the risk of saturation as global companies’ taps Indian market. 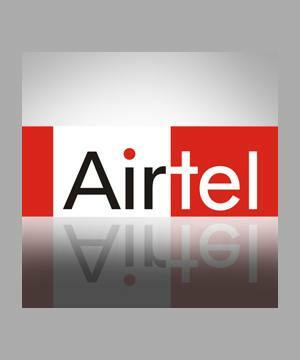 Bharti Airtel, India's top mobile operator, added 2.51 million mobile users in September, its slowest pace of additions since May 2008 and compared with 2.81 million users added in August, data from the Cellular Operators' Association of India (COAI) showed. This will affect the sales figures of Bharti in the coming quarter results. As earlier I have said that the company can only remain competitive by overseas expansion since that will add more subscribers.3G auction will give Bharti new dimension to dominate the domestic market and scale to new heights. Both of these will increase the shareholders profitability. Investors will gain good return by taking a long term call for doing investments. Any acquisition made by Bharti in the overseas market will increase the sales of the company. 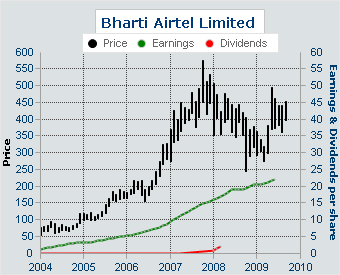 So in the long term Bharti remains a high alret for doing investment. But looking at the current valuation of the stock and the over world market it would be wise decision to book profit after watching the 2nd quarter results and wait in the sidelines to have some correction in the market as whole. This will give the investors competitive investing in the stock. For long term it’s a good stock to add in your portfolio. The below chart shows the earnings comparison with the price of the share followed with didvidends.The chart clearly shows that earnings were consitenly rising mode along with the perice upward and down ward movement.It shows that its a consitent in the log run in creating investors value for investment. As additions of subscribers got reduced in the month of September we might get some fall in earnings. But at the same time a cautions note to be taken that it might also surprise us with good 2nd quarter results. So wait and watch and book part profits in the current scenario and hold the remanining to take advantage of any upside or downside for long term investment. Mr. Indraneel, Report gives broader view on financials as well as technicals of Bharti. But I guess Support and Ressistance you hav shared are Intraday levels, if you are taking it as a long term investments, would want you to share its long term support and ressistance levels.